Recent press coverage has described Rep. Ron Paul's appeal to young voters as based on the combination of his conservative economics with liberal social views. This might suffice as a simplistic explanation of the libertarianism of some Americans, but it does not accurately represent Paul's ideology. Paul's brand of libertarianism is shared with the frequently overlapping John Birch Society, Constitution Party and Conservative Caucus (both founded by Howard Phillips), and the American branch of the Austrian School of Economics - the Ludwig von Mises Institute. Like Paul, these groups are located on the ultra-conservative end of the political spectrum. Their distinguishing feature is a brand of libertarianism in which the federal government is to be dramatically reduced in favor of "states' rights" and, as described by the Constitution Party, local application of "jurisprudence based on biblical foundations." This is theocratic libertarianism, the type of libertarian "freedom" promoted by Christian Reconstructionist Rousas J. Rushdoony. Theocratic libertarianism may sound like an oxymoron, but it appeals to a segment of the American population that could never embrace Ayn Rand's atheistic Objectivism. It draws heavily from those in the South who still harbor anti-federal government animosity left over from the Civil War and Cold War warriors who sanctified capitalism as the godly alternative to atheistic communism. The idea that America was founded as a divinely ordained bastion of laissez-faire capitalism, to be governed by biblical law at the local level, was codified by the late Rousas Rushdoony in his 1973 Institutes of Biblical Law. The numbers of self-proclaimed "Dominionists" in the Christian Reconstructionist camp are small, but Rushdoony's foundational narratives have spread like wildfire throughout much of the Religious Right, contrary to denials in the press. (See 1, 2, and 3.) We are not likely to see the stoning of adulterers and homosexuals in the streets any time soon, although that was a feature of Rushdoony's plan for a reconstructed America, but Rushdoony's narratives have been widely embraced - including his version of American history in which there was no intent of separation of church and state and his claims that unfettered capitalism is biblically mandated. "In the name of toleration, the believer is asked to associate on a common level of total acceptance with the atheist, the pervert, the criminal, and the adherents of other religions." That's Austrians, as in the Ludwig von Mises Institute in Auburn, Alabama, founded by Llewellyn Rockwell, Jr. in 1982 as the center for Austrian School Economics in the U.S. In a 2003 Southern Poverty Law Center report, Chip Berlet describes the Ludwig von Mises Institute. It also promotes a type of Darwinian view of society in which elites are seen as natural and any intervention by the government on behalf of social justice is destructive. The institute seems nostalgic for the days when, "because of selective mating, marriage, and the laws of civil and genetic inheritance, positions of natural authority [were] likely to be passed on within a few noble families." But the rule of these natural elites and intellectuals, writes institute scholar Hans-Hermann Hoppe, is being ruined by statist meddling such as "affirmative action and forced integration," which he said is "responsible for the almost complete destruction of private property rights, and the erosion of freedom of contract, association, and disassociation." A key player in the institute for years was the late Murray Rothbard, who worked with Rockwell closely and co-edited a journal with him. The institute's Web site includes a cybershrine to Rothbard, a man who complained that the "Officially Oppressed" of American society (read, blacks, women and so on) were a "parasitic burden," forcing their "hapless Oppressors" to provide "an endless flow of benefits." "The call of 'equality,'" he wrote, "is a siren song that can only mean the destruction of all that we cherish as being human." Rothbard blamed much of what he disliked on meddling women. In the mid-1800s, a "legion of Yankee women" who were "not fettered by the responsibilities" of household work "imposed" voting rights for women on the nation. Later, Jewish women, after raising funds from "top Jewish financiers," agitated for child labor laws, Rothbard adds with evident disgust. The "dominant tradition" of all these activist women, he suggests, is lesbianism. In 2008, two journalists writing for Reason Magazine concluded that Paul's racist newsletters from the 1990s were probably ghost written by Lew Rockwell, founder and currently chairman of the Ludwig von Mises Institute, and a former chief of staff for Paul. This conclusion has been repeated recently by other media outlets, but without including the fact that Paul continues to contribute on a regular basis to Rockwell's newsletter at www.LewRockwell.com. Paul's latest post was dated December 28, 2011 (last week). For more from Lew Rockwell about his work with Ron Paul, Rockwell's split with the Koch brothers and their libertarian financing, and his view of Martin Luther King, Jr., read his interview at at the Ludwig von Mises Institute. It is an interesting window into the internal struggles of the libertarian world. Another regular contributor to LewRockwell.com is Gary North, one of the most prolific of Christian Reconstructionist writers, son-in-law of Rousas Rushdoony, and adjunct faculty at the Ludwig von Mises Institute. Gary North also worked for Ron Paul during his first term in Congress. Gary North's latest contribution is listed in the archive as "Ron Paul is our Moses" and was posted on December 31, 2011. North was the topic of a New York Times article in April, 2011, titled Christian Economics' Meets the Antiunion Movement. "According to Reconstructionism, a Christian theocracy under Old Testament law is the best form of government, and a radically libertarian one. Biblical law, they believe, presupposes total government decentralization, with the family and church providing order. ...Mr. North, who is Mr. Rushdoony's son-in-law but was not on speaking terms with him from 1981 until Mr. Rushdoony's death, focuses on how that biblical libertarianism applies to economics. He concluded that the Bible forbids any welfare programs, is opposed to all inflation, and requires a gold-coin standard for money." Rushdoony's writings are the source of many of the core ideas of the New Christian Right, a voting bloc whose unforeseen arrival in American politics in 1980 caught the media by surprise. This bloc voted overwhelmingly for Ronald Reagan. Two weeks after Reagan was inaugurated, Newsweek (Feb. 2, 1981) accurately but very briefly identified Rushdoony's Chalcedon Foundation as the think tank of the Religious Right. But the mainstream media did not take the hint. They never did figure out where these ideas were coming from. Jerry Falwell and Pat Robertson were on television, and the media's intellectuals, such as they are, believe that television is the source of world transformation. Rushdoony in 1981 was almost unknown outside of the leadership of New Right/New Christian Right circles. So he remained at his death. Rushdoony's ideology was boosted by support of wealthy sponsors including Howard Ahmanson, who served on the board of Rushdoony's Chalcedon Foundation, and by politicians including Howard Phillips, the founder of the Conservative Caucus and the U.S. Taxpayers Alliance. The latter is now called the Constitution Party and Phillips was the party's candidate for president in 1992, 1996, and 2000. Both Ron Paul and Rand Paul have been speakers for Constitution Party events and Ron Paul endorsed the Constitution Party's candidate for president, Rev. Chuck Baldwin, in 2008, instead of Republican nominee John McCain. Ron Paul was the keynote speaker at the 35th anniversary of Howard Phillips' Conservative Caucus. For forty-eight years a single organization has led the way in preserving America's national sovereignty while helping to fortify the moral blockade on our failing culture. And like most organizations that stand up to the machinations of wickedness, this group has suffered the unjust disparagement and ridicule from those who misunderstand its mission or are trying to subvert its efforts. This contempt of The John Birch Society (JBS) has left it isolated with few who will call themselves "allies" to its cause. Those who have stood long beside Chalcedon, and the mission of Christian Reconstruction, can heartily empathize with that same sense of national quarantine. ... The JBS has preserved itself by maintaining a simple but effective model of information distribution, and both my father and I have participated for many years as representatives for both the mission of the JBS as well as Christian Reconstruction. We see them as having complementary missions, and both endeavors are needed now more than ever. My hope is that after reading this article, you will have a greater appreciation for organizations like the JBS and Chalcedon. Such groups deserve our support and prayers." Paul has close ties to the John Birch Society and has spoken at JBS events, including one in February described in Tea Party advertising as "the biggest John Birch Society event to be held in Pittsburgh in decades." Other speakers included JBS president John McManus, CEO Arthur Thompson and Southwest Pennsylvania JBS leader Andy Dlinn, an Orthodox Jew, speaking on the "Biblical Basis for Americanist Principles." In an interview with the Pittsburgh Post Gazette following the event, McManus responded to the suggestion that the JBS has a reputation of paranoid belief in radical conspiracy theories. "'They're not conspiracy theories when they're facts,' he said. `But is it radical to stand for the Constitution and the Ten Commandments? If it is, then, yeah, we're radical.'" McManus also described the John Birch Society's role in mentoring the Tea Party movement. "Fortunately, the John Birch Society has been there providing the tools and ammunition to bring these newbies into the movement." These tools have included the JBS-produced movie "Overview of America," which has been popular with Tea Party groups across the nation and Religious Right organizations. Alternet article "5 Reasons Progressive Should Treat Ron Paul With Extreme Caution -- 'Cuddly' Libertarian Has Some Very Dark Politics." 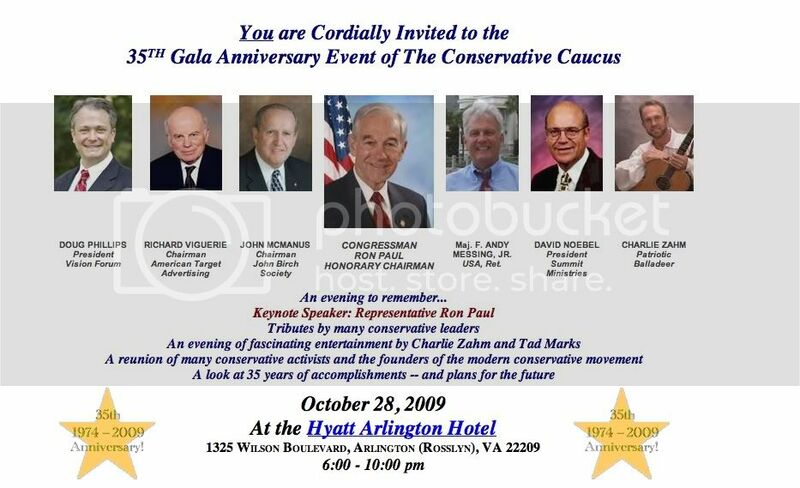 A February 2011 Washington Post article described Ron Paul's ties to the Austrian School of Economics, including his invitation to two Austrian School economists to speak at his first hearing as chair of the House Financial Services Committee. One of these was Thomas DiLorenzo, faculty at the Ludwig von Mises Institute and another regular contributor to LewRockwell.com. DiLorenzo's latest post is dated January 4, 2012 and is introduced as "Will Ron Paul Destroy the Party of Lincoln? And would that be bad?" The movement has an appeal for neo-confederates and apologists for the Confederacy. This sentiment can be seen in a 2003 letter to Lew Rockwell titled Catholic Confederate Libertarian written by a young Catholic entering seminary who attended one of the LewRockwell.com sponsored Lincoln Reconsidered conferences. He writes to Rockwell (also a Catholic) about the "common bond between my traditional Catholic beliefs and my Confederate heritage." "LewRockwell.com seems to be a place where this same simplicity is championed. There, as in my own life, I recognize the convergence of traditional Catholic intellectualism combined with a distinctly Southern brand of libertarianism." "It's living proof that the establishment is worried and threatened by Ron Paul and our movement." "And here to give us the inside scoop on all things Ron Paul, how America can get behind this true constitutionalist is the editor and chief of Lew Rockwell.com, none other than Lew Rockwell, who also of course served as Ron Paul's chief of staff. So, it doesn't get any better than Ron Paul, but if there has to be a second brightest spot in the universe, it's Lew Rockwell. ....Out of the gates, can Ron Paul win? "Yes, Ron Paul can win and in fact the fear that the media is exhibiting by first trying to put the black-out on him and then of course demonizing him when they're not trying to black him out shows that they are very afraid. He's talking about issues that are resonating with the American public as never before." In 1991, Sarah Diamond wrote about Howard Phillips's efforts to promote his U.S. Taxpayer's Alliance (now Constitution Party) as the nation's third major political party. "Howard Phillips correctly sees third party building as a long-term proposition, and he's banking on the kind of economic downturns that will give his message greater resonance. 'My hope is that there are circumstances in which people are so upset at the way things are going that without even necessarily knowing or buying into all of the things that we advocate or believe, they will support us in protest against the things they disapprove,' Phillips said in an audio tape circulated to USTA supporters. 'The medicine we're prescribing doesn't taste good and people are only going to take it when they have no choice.'" Are Ron Paul's more liberal-minded supporters falling into Howard Phillip's trap of supporting Paul "in protest of the things they disaprove" but "without even necessarily knowing or buying into all of the things that we advocate or believe?" Caveat emptor! I've posted a second article on this topic titled Theocratic Libertarianism: Quotes from Gary North, Ludwig von Mises Institute Scholar. Thank you for this piece; full of important information and chilling to (post)Keynesian Christians. Great story, Rachel. And one that needs wide circulation. The Paulbots cannot see past "end wars" and "decriminalize pot". I've been preaching this message for years to friends who support Paul, but it is hard to get through to them! The man has way too many connections that cannot be denied. Ron Paul still has to win the nomination, which given his egotism, will be harder than it looks. Also his previous racist writings will be an albatross around his neck for some time to come. Michael Lind has noted that the dominionist and Tea Party types have applied concepts of biblical inerrancy to endorse specific political and economic agendas (Austrian economics and theocratic governance.) This article ties these issues together nicely.